Rose Trevelyan's peaceful life is rocked by the murder of an old friend. when Rose learns that it wasn't a heart attack but a case of suicide her suspicions are immediately roused. Dorothy would never have killed herself - but would anyone else have the motive to murder? And are the valuable paintings hanging on the walls the clue to the mystery? Would have enjoyed it more if there were not so many typos. Some sentences made no sense. Otherwise it was a good read. I love Jane's descriptions of the Cornish rugged coast and her very likeable character Rose Trevelyan who is a talented painter and sleuth detective, a very interesting mix. 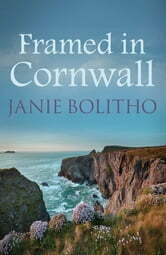 Excellent book as are all her "...in Cornwall" series of books. What a shame we had such a limited time of her writing.